A 101-word story that perfectly captures one of Florida's many dualities. 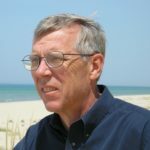 Paul L. Bancel’s short stories and op-ed pieces have appeared in a number of Michigan publications and The Ann Arbor News. Heidelberg Street was the setting for his award-winning story, "The Polka Dot House," published for the Detroit Tri-Centennial. He has also written and produced two plays about Amelia Earhart, Jealous Sky and Driving Them Crazy for the Indianapolis Fringe Festival.